Cryptocurrency such as Bitcoin has garnered most of the media coverage and hype to date, but keep your eye on blockchain – this new technology is poised to change IT in much the same way open-source software did a quarter century ago. Blockchain, which began to emerge as a real-world tech option in 2016 and 2017, is poised to change IT in much the same way open-source software did a quarter century ago. And in the same way Linux took more than a decade to become a cornerstone in modern application development, Blockchain will likely take years to become a lower cost, more efficient way to share information and data between open and private business networks. Based on a distributed, peer-to-peer (P2P) topology, blockchain or distributed ledger technology (DLT) allows data to be stored globally on thousands of servers – while letting anyone on the network see everyone else's entries in real-time. That makes it difficult for one user to gain control of, or game, the network. However, in highly publicized incidents over the five years, blockchains have been hacked, typically through a cryptocurrency application such as bitcoin. Smaller blockchains with fewer nodes (or computers) have also been susceptible to fraud, with would-be thieves gaining control of the majority of nodes. For businesses, however, blockchain holds the promise of transactional transparency – the ability to create secure, real-time communication networks with partners around the globe to support everything from supply chains to payment networks to real estate deals and healthcare data sharing. Recent hype around this relatively new technology is real because DLT, in essense, represents a new paradigm for how information is shared; tech vendors and enterprises, not surprisingly have rushed to learn how they can use the distributed ledger technology (DLT) to save time and admin costs. Numerous companies have already rolled out, or are planning to launch, pilot programs and real-world projects across a variety of industries - everything from financial technology (FinTech) and healthcare to mobile payments and global shipping. So while blockchain isn't going to replace traditional corporate relational databases, it does open new doors for the movement and storage of transactional data inside and outside of global enterprises. Driven mainly by financial technology (fintech) investments, blockchain has seen a fast uptick in adoption for application development and pilot tests in a number of industries and will generate more than $10.6 billion in revenue by 2023, according to a report from ABI Research. Most of that revenue figure is expected to come from software sales and services. Blockchain adoption is expected be steady, as the changes it brings gain momentum, according Karim Lakhani, a principal investigator of the Crowd Innovation Lab and NASA Tournament Lab at the Harvard Institute for Quantitative Social Science. "Conceptionally, this is TCP/IP applied to the world of business and transactions," Lakhani said. "In the '70s and '80s, TCP/IP was not imaginable to be as robust and scalable as it was. Now, we know that TCP/IP allows us all this modern functionality that we take for granted on the web. "Blockchain has the same potential." 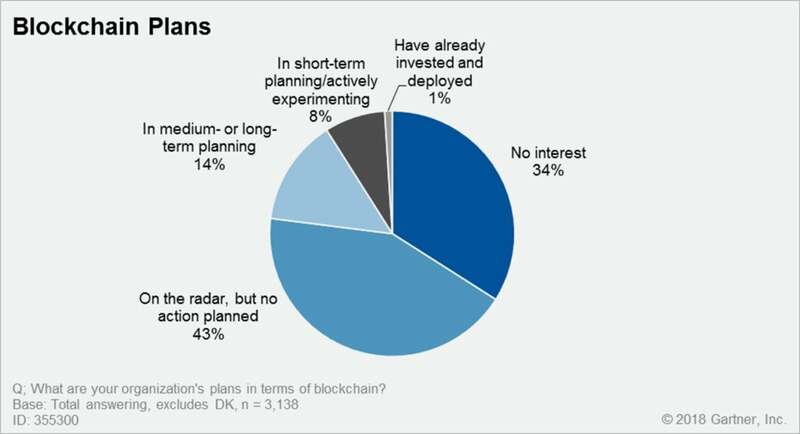 A Gartner survey of CIOs last spring revealed only 1% had blockchain deployed in production environments; that number has grown to 3.3% today, according to Gartner Distinguished Analyst Avivah Litan. Martha Bennett, a principal analyst for Forrester Research, noted any blockchain or "DLT" project is a long-term strategic initiative, and disappointment is inevitable "when the hoped-for miracles fail to materialize. "It's not realistic to expect a solid cost model or definitive benefits statement because it's simply too early for that," Bennett said. "To assemble real evidence, we need to have a number of fully operationalized, scaled-out deployments running for at least a couple of years. And we're simply not there yet." First and foremost, blockchain is a public electronic ledger built around a P2P system that can be openly shared among disparate users to create an unchangeable record of transactions, each time-stamped and linked to the previous one. Every time a set of transactions is added, that data becomes another block in the chain (hence, the name). Blockchain can only be updated by consensus between participants in the system, and once new data is entered it can never be erased. It is a write-once, append-many technology, making it a verifiable and auditable record of each and every transaction. While it has great potential, blockchain technology development is still early days; CIOs and their business counterparts should expect setbacks in deploying the technology, including the real possibility of serious bugs in the software used atop blockchain. And as some companies have already discovered, it's not the be-all solution to many tech problems. Blockchain standards organizations, universities and start-ups have proposed newer consensus protocols and methods for spreading out the computational and data storage workload to enable greater transactional throughput and overall scalability – a persistent problem for blockchain. And the Linux Foundation’s Hyperledger Project has created modular tools for building out blockchain collaboration networks. While some industry groups are working toward standardizing versions of blockchain software, there are also hundreds of startups working on their own versions of the distributed ledger technology. Each digital record or transaction in the electronic ledger is called a block. When a block is completed, it creates a unique secure code that ties it to the next block. The term bitcoin was first... well, coined in 2008 when Satoshi Nakamoto (likely a pseudonym for one or more developers) wrote a paper about a "peer-to-peer version of electronic cash that would allow online payments to be sent directly from one party to another without going through a financial institution." For more than a year, however, Bitcoin has been on a roller coaster ride, with its value dropping from a peak of nearly $20,000 to a little more than $3,500, mainly due to the fact that it has no intrinsic value; its worth is based only on high demand and limited supply. Unlike fiat currencies or stocks, there is no institution or government backing the value of bitcoin. That may change for cryptocurrencies someday. Governments have already made overtures toward creating stablecoins, or cryptocurrency that’s backed by a stable asset such a gold or traditional fiat currency. Blockchain is also being used to digitize other assets, such as cars, real estate and even artwork. 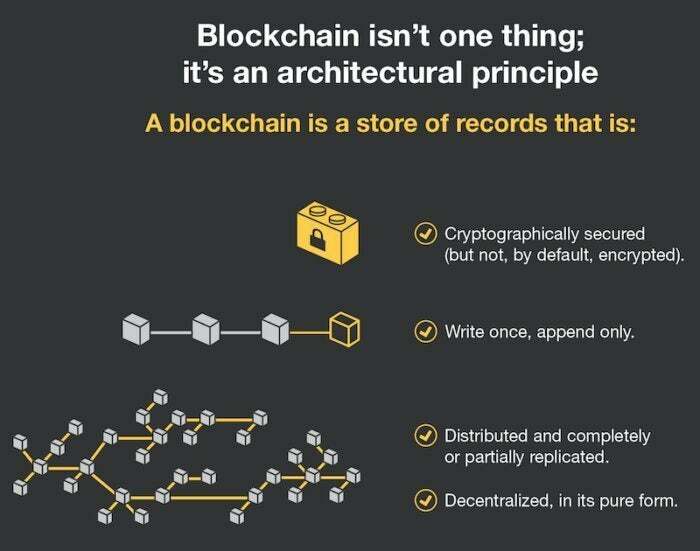 Blockchain, or distributed ledger technology, isn't a single technology. Rather it's an architecture that allows disparate users to make transactions and then creates an unchangeable, secure record of those transactions. As a peer-to-peer network, combined with a distributed time-stamping server, public blockchain ledgers can be managed autonomously to exchange information between parties. There's no need for an administrator. In effect, the blockchain users are the administrator. A second form of blockchain, known as private or permissioned blockchain, allows companies to create and centrally administer their own transactional networks that can be used inter- or intra-company with partners. 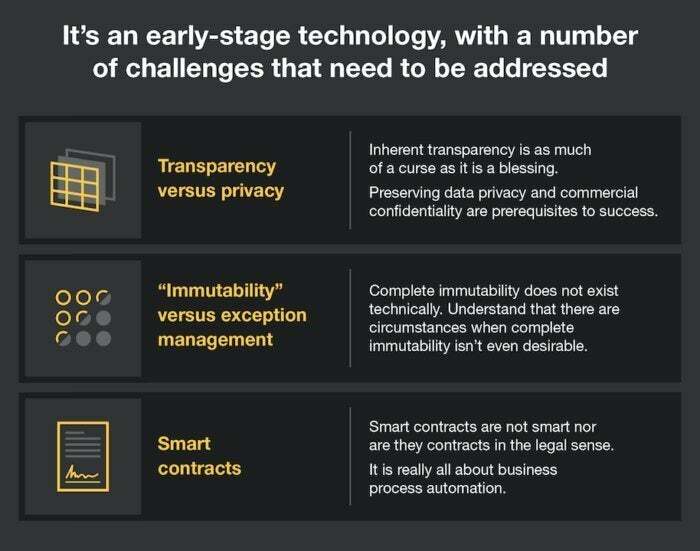 Additionally, blockchain networks can be used for "smart contracts," or scripts for business automation that execute when certain contractual conditions are met. For example, after a bad batch of lettuce resulted in customers becoming sick from e-coli, Walmart and IBM created a blockchain-based supply chain to track produce from farm to table. Walmart has asked its produce suppliers to input their data to the blockchain database by September 2019. Once on the blockchain, produce can be automatically tracked through smart contracts from point to point, removing human intervention and error. 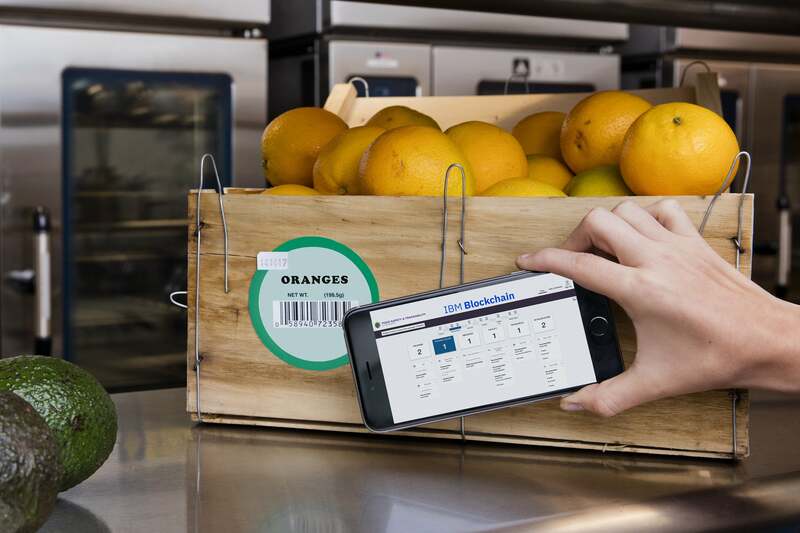 After piloting a blockchain-based produce supply chain tracking system, Walmart and Sam's Club are telling suppliers to get their product data into the system so they can begin tracking produce from farm to store. The deadline: September 2019. De Beers,which controls about 35% of the world's diamond production, has also launched a blockchain-based supply chain to track diamonds for authenticity and to help ensure they aren’t coming from war-torn regions where miners are exploited. Smart contracts can also be used to approve the transfer of assets, such as real estate. Once conditions are met between buyers, sellers and their financial institutions, property sales can be confirmed on DLT. For example, New York-based ShelterZoom this year is launching a real estate mobile application that lets real estate agents and clients see all offers and acceptances in real time online. It will also allow access to property titles, mortgages, legal and home inspection documents through the Ethereum-based encrypted blockchain ledger. 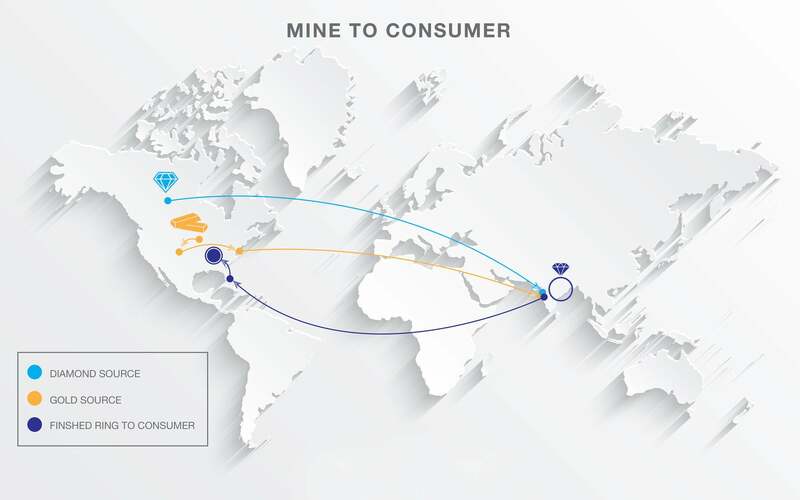 The De Beers's TrustChain blockchain network will track and authenticate diamonds, precious metals and jewelry at all stages of the global supply chain, from the mine to the retailer. While no system is "unhackable," blockchain's simple topology is the most secure today, according to Alex Tapscott, the CEO and founder of Northwest Passage Ventures, a venture capital firm that invests in blockchain technology companies. "In order to move anything of value over any kind of blockchain, the network [of nodes] must first agree that that transaction is valid, which means no single entity can go in and say one way or the other whether or not a transaction happened," Tapscott said. "To hack it, you wouldn't just have to hack one system like in a bank..., you'd have to hack every single computer on that network, which is fighting against you doing that. "So again, [it's] not un-hackable, but significantly better than anything we've come up with today," he said. The computing resources needed for most blockchains are tremendous, Tapscott said, because of the number of computers involved. For example, the bitcoin blockchain harnesses anywhere between 10 and 100 times as much computing power as all of Google's serving farms put together. As with any emerging technology, blockchain faces challenges and barriers to adoption. But even a larger scale can't always prevent hacks. A recent “51 percent attack” on the Ethereum Classic token exchange showed why even blockchain is not impermeable to gaming. A 51 percent attack refers to a bad actor who gains control of the majority of CPUs in a cryptocurrency mining pool. Such attacks are generally limited to smaller blockchains with fewer nodes because they're more susceptible to a single person seizing control based on a Proof of Work (PoW) consensus mechanism. Even though blockchain networks are secure, the applications running atop them may not be as safe, according to Bruce Schneier, a cryptographer and security expert. "That's not how this sort of thing will get broken. It'll get broken because of some insecurity in the software," Schneier said. One of the major issues facing blockchain involves scalability, or its ability to complete transactions in near real time, such as clearing payments via credit cards. Scalability has already been identified as an issue with cryptocurrencies such as bitcoin and Ethereum's Ether. If a distributed ledger is to achieve adoption by financial technology (FinTech) companies and compete with payment networks hundreds of times faster, it must find a way to boost scalability and throughput and address latency problems. Sharding is one of several popular methods being explored by developers to increase transactional throughput. Simply stated, sharding is a way of partitioning to spread out the computational and storage workload across a P2P network so that each node isn't responsible for processing the entire network's transactional load. Instead, each node only maintains information related to its partition, or shard. The information contained in a shard can still be shared among other nodes, which keeps the ledger decentralized and theoretically secure because everyone can still see all ledger entries; they simply don't process and store all of the information such as account balances and contract code, for instance. In today's blockchains, each authenticating computer or node records all the data on the electronic ledger and is part of the consensus process. 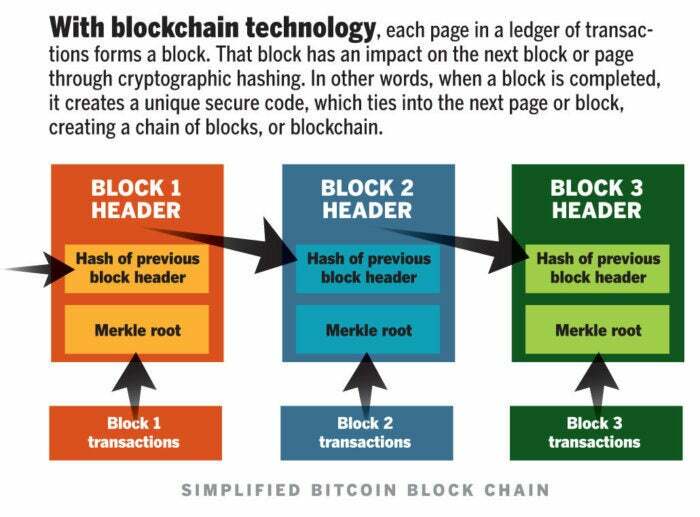 In large blockchains such as bitcoin, the majority of participating nodes must authenticate new transactions and record that information if they are to be added to the ledger; that makes completing each transaction slow and arduous. Because of that, bitcoin, which is based on a PoW, can only process 3.3 to 7 transactions per second – and a single transaction can take 10 minutes to finalize. Ethereum, another popular blockchain ledger and cryptocurrency, is only able to process from 12 to 30 transactions per second. By comparison, Visa's VisaNet on average processes 1,700 transactions per second.